I have a tinsel decoration which keeps falling down. But I am saying oh no you don't, we still need you. It's not over yet! I'm not quite ready for the bareness of January, although glorious blue skies will help. Today we have torrential rain and snuffles have arrived. 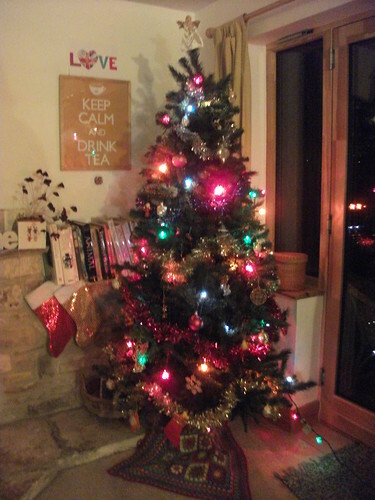 But the pretty twinkling lights and tree are helping see us through to the new year. our tree in all it's glory! I'm not sure how I will cope without my fairy lights......I may have to put in a large jar and carry on enjoying them. I especially like turning these on in the evening, so that passersby can enjoy them too! These are the soft vintage lights which I still have since my childhood. I love them so much! I will keep them up until the 4th, which is my way of counting the 12 days of christmas, (from christmas eve that is!). Then I will hope for sunshine and blue skies to take us through January. I think we need a rather large dose of hope right now to see us through these darker days. christmas morning in the sunshine, so busy! 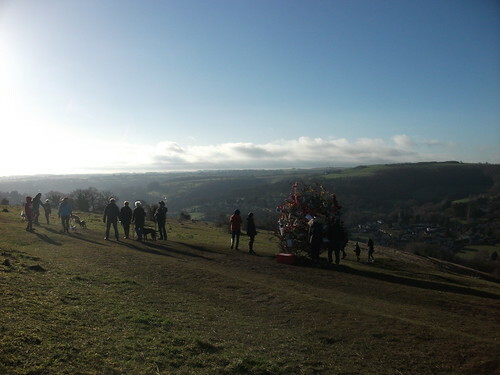 We had this glorious sunshine on christmas day. The boy, agreed to walk with me, before plugging in the new technology too! We put on our christmas hats and felt silly.....it was fun! The white flags were definitely waved on christmas day. I feel we are re-building our christmas traditions, really from the ground up. It's not easy when there is only one parent and one child. We have had some seriously difficult events around previous christmas times. That we are still only learning how to ground oursleves from. There has been loss, accident, trauma, illness. Families shaken to the core. Is that dramatic? probably. We are not quite out the otherside yet either. But I am seriously grateful for any little light and joyful moment that comes. It's a mixed bag isn't it. It's not too late though. each year we can build on little successes. This year I got the gravy right, and the roast potatoes! (I did drop half in the bottom of the oven though!) but even that will become a christmas story too. Oh and friendly neighbors who invite you over to share some wine in the evening, god bless them! yes both days! there are some good people in this world. Happy Christmas days to you and your son. I am so glad this Christmas brought you both some happy times which, as you say puts a gentle balm on sadder times. Keep those lights twinkling for as long as possible and I really do hope 2014 turns out to be a very special year for you both. Hi Heather, Merry Christmas to you and your son!!!! So glad to hear about the positive progress made over this season!!! I am also thinking of keeping my fairy lights out and going for as long as possible!!! I sit every night like a child as they mesmerize me completely!!! Such a wonderful escape!!!! Have a fun-fabulous week!!!! What a lovely reflective post and I send my love and best wishes to you. All times of change are hard and harder still is carrying on, but may you find even more strength to enfold you in a warm, bright glow not unlike your very lovely twinkly fairy lights. Always such a pleasure to see a new post from you is up! And savor your words and photos. I am sure you'll find your way, and it will be good, very good. We take down our tree on New Year's Day but I enjoy having it up for those days after Christmas. It's very comforting and homey, especially the lights. My fairy lights and bell wreath are staying up until Spring. I have to have color.... can't bear plain walls. I am happy for white flags! ;) Hope you and your son have a fantastic New Year!! 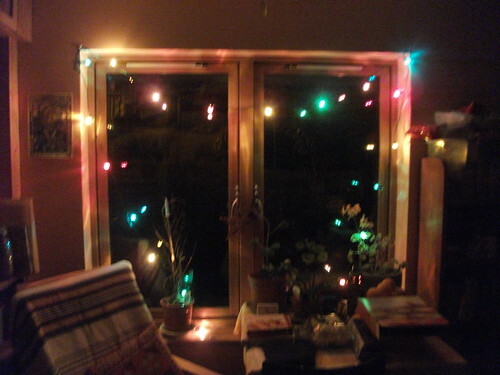 We have fairy lights strung across our kitchen windows and they stay there year round. Absolutely love them. Just the perfect amount of light when all the others are turned off ~ they give off such a lovely glow. Thank you so much for this post Heather, it made me think. I know you had alluded to family tensions over the year and I was so genuinely happy to hear that you found some familial peace and joy on Christmas Day. It's never too late to rebuild traditions, and relationships. I hope there are more and more moments like that throughout 2014. 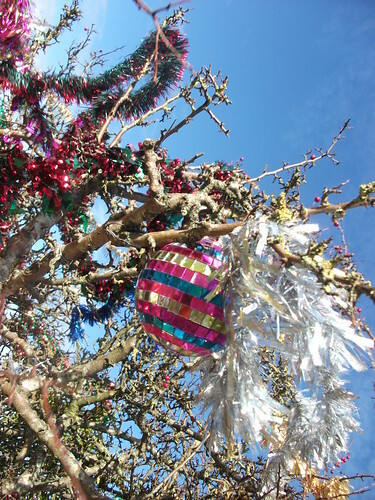 Keep the fairy lights - I have mine out all year round! I hope you had a wonderful Christmas. Happy New Year to you and your family! I am with you, keeping the cheer and joy going till the last minute, before the house looks bare again! Glad you had a lovely day for Christmas, and I wish you and your boy all the best for a wonderful 2014! Oh I forgot to say, we have just returned from a weekend away in your part of the world, staying at The Wild Duck near Cirencester. How beautiful it is there! What a wonderful place for your boy to grow up! I am a Dorset girl myself, and love the countryside although I spend most of my time in London.